Cracked Out Chicken Dip - this stuff is SO addicting! CRAZY good!! Chicken, cream cheese, ranch mix, bacon, cheddar cheese and milk. This makes a ton! Great for parties! Can make ahead and refrigerate until ready to serve. Everyone LOVES this dip! 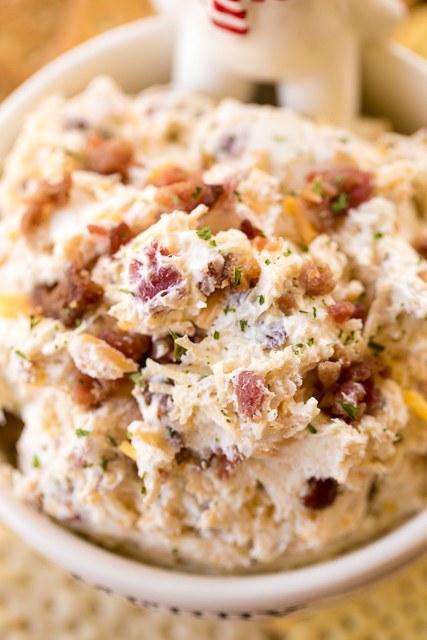 This Cracked Out Chicken Dip is totally addicting! OMG! I couldn't walk past it without taking a bite. 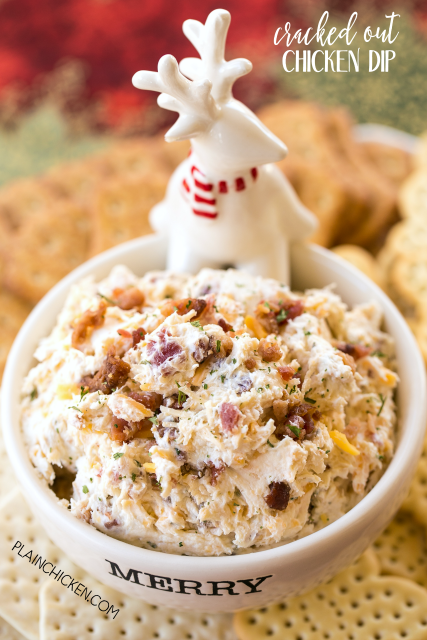 Cheddar, bacon, ranch, chicken and cream cheese - so easy and SOOOO good! This can be made a few days ahead of time and refrigerated until you are ready to serve the dip. I always take a few snacks down to my parent's house for Christmas, and this Cracked Out Chicken Dip is definitely one of the ones I'm taking this year. We ate this with crackers, but it would also be good with pita chips and some celery. Heck, it's good straight off the spoon! LOL! Drain and rinse canned chicken. Stir together chicken, cream cheese, ranch mix, bacon bits, cheddar cheese and milk. Have you ever tried this with boiled chicken rather than canned chicken? Where did you find that dip bowl? I want one. Super good easy, fast....used real bacon tho, matter of preference...a real hit!!!! do you think i could use a rotisserie chicken and just shred it up? Just made this for first time for lunch at work tomorrow. Husband and daughter both approve. I think next time I will add some green onion.